It might work in “Back to the Future”; it doesn’t work in logic. But just like “Hope and Change,” what does that really mean? “Forward” in which direction? “Forward” toward communism? “Forward” toward totalitarianism? Just like “hopey changey,” this is an intrinsically meaningless slogan that pretends to stand for something. MINGO JUNCTION, Ohio — Hope has been absent for so long from Appalachian Ohio that many people have forgotten what it’s like. Idle steel mills run the length of several city blocks, empty and rusting on the thickly wooded banks of the Ohio River, like hulking tombstones for a past that died and the promise that died along with it. What optimism exists has little, if any, connection to the presidential campaign, which for all its import feels distant and somehow beside the point. James Rogers worked happily in the mills for 23 years, until he was laid off in 2009. He is studying to be a nurse; a job, true, but one he doesn’t really want. Still, at 44 he has a mortgage, a home deep underwater and two kids to put through college. He figures healthcare offers his best shot at a reliable paycheck. With the coal mines giving out and the steel business decimated — about 1,500 people work in the few surviving mills, compared with 30,000 at the peak — the medical industry is by far the largest employer in Jefferson County. Young people here tend to escape if they can, leaving the frail and aging behind. To Rogers, it doesn’t matter who wins the White House in November. He’s a Democrat and supports President Obama but doubts much would change in a second term. Still, Romney has this going for him: He’s not Obama. The president frightens Bower with his expansive healthcare overhaul, his rhetorical shots at the rich and the red ink that has gushed over the last three years. More frightening still, Bowers said, is the prospect of Obama spared future elections and thus free to push even more radical policies. Median income in South Los Angeles is lower now than during the 1992 riots, and the unemployment rate has reached even more dire levels. Two decades after the L.A. riots brought pledges of help to rebuild South Los Angeles, the area is worse off in many ways than it was in 1992. Median income, when adjusted for inflation, is lower. Many middle-class blacks have fled in search of safer neighborhoods and better schools. And the unemployment rate, which was bad at the time of the riots, has reached even more dire levels. In two areas of South Los Angeles — Florence Graham and Westmont — unemployment is almost 24%. Back in 1992, it was 21% in Florence Graham and 17% in Westmont. Last summer, thousands of South Los Angeles residents showed up to a job fair that brought out almost 200 employers at Crenshaw Christian Center on Vermont Avenue. The event, organized by Rep. Maxine Waters (D-Los Angeles), was seen by some as grandstanding. Of course, the same people who burned down their lives in 1992 are the same people who burned down their own lives when they voted for Obama in 2008 and will burn vote to burn down their own lives again in 2012. Well, if Obama ran on “hope and change” again, even his own voters would openly laugh in their Fool-in-Chief’s face. Hope is gone because Obama has poisoned hope in America. And the only “change” you’re going to see is the change to open communism and (“hopefully”) a few cents’ worth of “change” in your otherwise empty pockets. 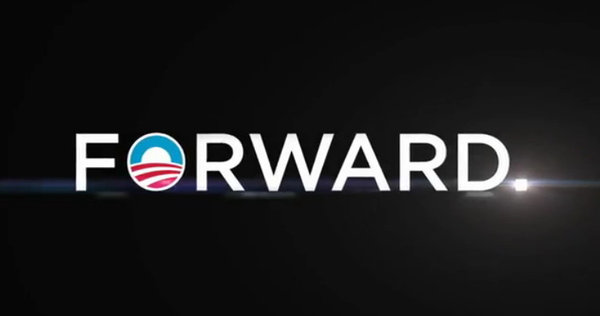 So we’re going to go “Forward” in some nebulous undefined direction now instead. And if we re-elect Obama, the United States is going to go “forward” into more ruin and depression and implosion than this once unconquerable nation has ever seen. To make the hypocrisy even MORE hypocritical, Obama is selling “Forward” by pimping the past: Slick Willie Clinton is doing the voice-over for his campaign now. What’s funniest about that is that the centerpiece of the ad is how Obama was the guy who made the courageous decision to get Obama; and the Obama campaign then asserts that Mitt Romney never would have had the balls to do that. That ad is vile for ALL KINDS OF REASONS, as I pointed out yesterday. Beyond all the other issues – such as the fact that Obama didn’t actually make the “courageous decision” at all; Obama delegated the decision to Admiral McRaven so he’d have a scapegoat if something went wrong; such as the fact that the decision to get bin Laden was pretty much a political no-brainer given that had Obama NOT gone in to get bin Laden he very definitely would have lived in infamy as the president who refused to get the man most responsible for the murder of 3,000 innocent Americans – there’s the fact that Slick Willie is a guy who could have prevented the 9/11 attack altogether if he’d just accepted Osama bin Laden’s head when the man was literally offered to Clinton on a silver platter by the Sudanese (and see here for more background on Slick Willie and terrorism). If Slick Willie had wanted to be honest, he could have at least have said that Obama made the hard decision that Bill Clinton was too much of a gutless coward to make or something to that effect. The media would have loved him even more, if anything. Wisonsin Democrats Fled To Illinois To Avoid Democracy. What’s THAT State Like With Union Pension Problems??? Where are the Democrat politicians who literally fled the state so they wouldn’t have to perform their democratic duty as members of a democracy and simply show up to VOTE? You know, represent the people by voting like people who aren’t Marxist-fascists are supposed to do? The high political drama comes as the standoff on the politically charged bill drags on, Democratic senators hide out in Illinois, a throng of tens of thousands demonstrate at the Capitol, and national figures weigh in on the events. Now why are they doing that? Because Republicans are trying to deal with the massive state budget crisis and union pensions that have crippled the state. And Democrats who ran on “hope and change” are willing to violate the democratic process in every single way, shape or form to preserve the utterly failed status quo. Okay. So Wisconsin Democrats don’t want to deal with the pension crisis in their financial broke state and so they ran off to Illinois. What’s going on to Illinois? I mean, surely when you flee to a better state, the state of affairs should at least be better than the one you’re fleeing from, right??? Before you vote on Tuesday, you should read this to get a better understanding of one of the biggest problems facing Illinois. Illinois’ unfunded pension liability, already the worst in the nation, is expected to spiral to even higher levels because the financially desperate funds are revising their investment goals downward. The funds are desperate on more than one front. They are not getting their monthly contributions from the state on a timely basis. And those delays are forcing them to sell fund assets at an annualized rate approaching 10 percent to pay benefits to retirees. The one-two punch is deflating their bottom line. Gov. Pat Quinn and the Illinois Legislature don’t intend to sit around and do nothing. What they’re likely to do, a mere two days after the election, is what they’ve always done: Borrow more. The rising price tags for Illinois taxpayers come as the Illinois Senate is set to reconvene Thursday, atGov. Pat Quinn’s request, to consider whether to borrow to meet annual pension obligations once again. The state would issue bonds for up to $4.1 billion in state contributions to the five funds in fiscal 2011, which began July 1. The move was approved by the House on May 25 but was not called for a vote in the Senate becauseDemocrats were not able to get the full support of their ranks needed for a three-fifths majority, and theRepublicans were not willing to step in. Some observers say not much has changed in the intervening time. But if the state does decide to borrow again, it will come atop more than $13 billion in previous borrowing for annual pension obligations, a portion of which ended up getting skimmed off for operating expenses during the tenure of former Gov. Rod Blagojevich. So, here’s the deal: A lame duck legislature and possibly a lame duck governor plan to put us deeper in debt. Even before the smoke from the election clears. Sound familiar? Here are the basics on Illinois’ three largest retirement funds. What did these Marxist Wisconsin Democrats do? They ran home to their big fat Marxist Mama in Chicago. And that big fat woman will wrap her big fat flabby arms around her children from Wisconsin and welcome them into the pig trough of union and big Democrat machine money she calls her home, sweet home. Don’t forget the hellhole the Wisconsin Democrats ran to. Because Democrats all over the country will be bringing the mega-disasters of states like Illinois to your door if you give them the chance.